Irvine is a large town on the west coast of Ayrshire. At the time of the Covenanters it was a small royal burgh. 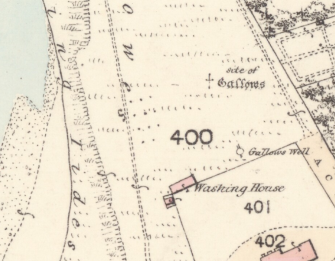 1856 Ordnance Survey 25" Map, showing site of Gallows on Irvine Moor. This page lists various associations the parish of Irvine has with the Covenanters. 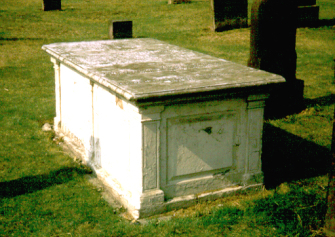 This is located in the old parish kirkyard. Located at the bottom of Seagate, the ruined castle was occupied at the time of the Covenanters by Georgew Gemmell of Craigfoot. He is noted as a persecutor of Covenanters. No longer surviving, the old Tolbooth of Irvine was located in the centre of the High Street. It was used as a prison for Covenanters, and in 1681 it was noted that it was too small to hold all of those arrested for attending Conventicles. In 1678 soldiers known as the 'Highland Host' were quartered in Irvine to suppress the local Covenanters. The site of the Gallows is marked on Irvine Moor by a set of cobbles formed in a shape. This is located just north of Marress Road, near to the Burns Statute. In addition to criminals being executed here, the two Pentland Covenanters, Blackwood and MacCall, were executed here.